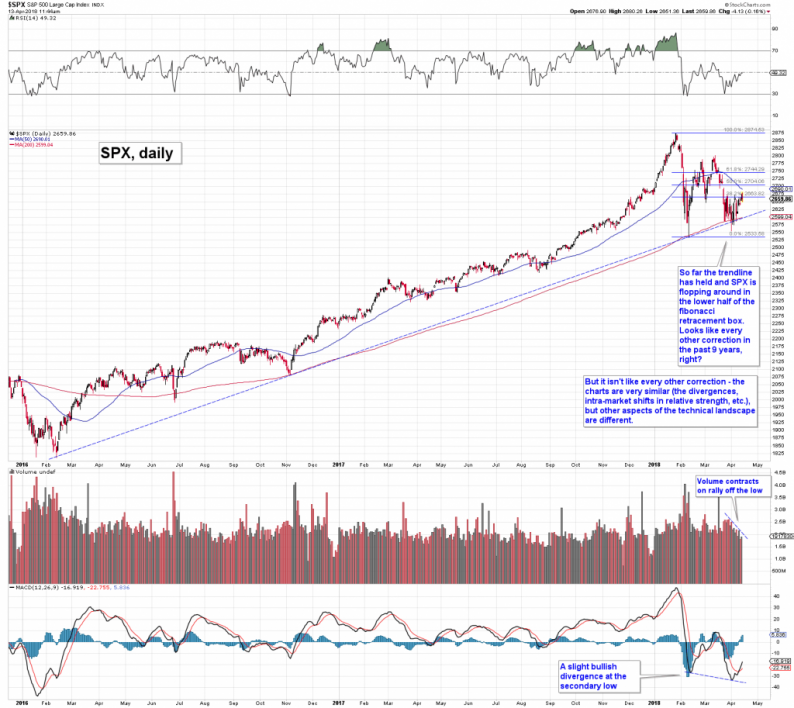 According to the “keep it simple” chart, this was just a run-of the mill correction, very similar to every other correction seen since the 2009 low. But is that really the case? The rebound from the trend-line is accompanied by an over-arching narrative. We are not referring to the news items that are supposedly responsible for jerking the market this way and that on a day-to-day basis (these consist mainly of Trump tweets on trade and military interventions, which he seems to use as part of his negotiating strategy, and the responses of his opponents to the moves he makes in this Twitter war). These explanations for market moves never make a lick of sense anyway: Donald Trump didn’t just become “unpredictable” this year. The Middle East didn’t turn into a proxy war battlefield brimming with betrayals and disinformation this week. The threat that trade barriers might be erected didn’t just fall unannounced from the sky either. It was a major part of Trump’s policies, frequently stressed during his campaign, reflecting views he has demonstrably held since at least the 1980s, if not longer. We are actually referring to something else, namely the upcoming earnings season. It is widely held that it will be business as usual, which is to say that nearly every important big cap index constituent will reliably manage to “beat expectations”, which will be followed by the usual gap-up moves into the blue yonder the day after. Hence it will be off to the races for the cap-weighted indexes again. Mind, superficially this isn’t even an unreasonable notion, given that it has worked umpteen times in recent years (i.e., basically every quarter – that’s how one can calculate the precise number represented by the variable “umpteen”). Is The World Coming To The End?